Self doubt is undoubtedly one of the greatest saboteurs to our success. When we believe we can do something we harness a power not only from deep within ourselves but beyond ourselves as well. Belief taps us into enthusiasm, passion, and inspiration – those ingredients that make this an abundance world. Doubt connects us with the exact opposite. We get tapped into feelings of scarcity, our insecurities and short comings. Doubts are dead weights that bring us to our knees. Why does self doubt have so much influence over our lives? Because being negative and a non believer is so much easier than being positive and having faith in the not yet manifested possibilities. It takes no effort or energy to “not try.” Not believing in yourself and your abilities requires no risk. Belief is intentional. So how do you deal with self doubt? By using the power of your intention. First, you need to remember that having doubts is normal. Doubt comes from the ego and are fear based thoughts. No one is Gung-ho 100% of the time. You’re not alone so give yourself a break if a doubt creeps in your mind. Don’t get too freaked out and let it throw you off your game. 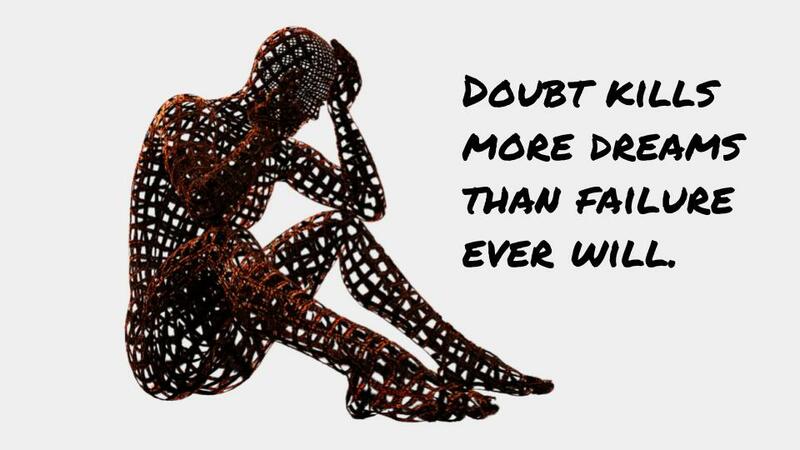 Doubts are not something to hide or deny or push away. That only gives power to your doubts. When you do that you’re trying to battle one fear with another one. That only magnifies fear exponentially. Since doubting is a function of the ego and the job of the ego is to keep us safe, the ego is just doing it’s job. Think of them like the brakes in a car. Brakes are a necessary part of driving a car. Gently use your doubts when you come to those intersections in your life where you need to pay attention or when life gets super hectic and you don’t want to spin out of control. The reason you feel so crappy when you have a doubtful thought is because it creates a gap between what your higher self knows is possible and what your ego wants to know is possible but hasn’t figured out yet how to achieve. Therefore, your energy is split between the ego you and the higher self YOU. Doubts give you a push-pull feel to life. Bottom line – being in the gap between you and YOU is uncomfortable. Accept it as a normal part of the process and if you did’t feel a little doubt you wouldn’t be feeling the edges of your potential. Second, it helps if you can catch a doubting thought early on before it gains too much momentum. Pay attention to how you feel when you think about your goal. Doubting thoughts don’t have to be blatantly negative on their face. They can sneak in under the radar. For example, the thought “What was I thinking? I could never achieve that goal,” is clearly a self doubting thought. But, “That goal sure is challenging” or “I’ve never done that before” could also be thoughts that emotionally sabotage your efforts. Again, when you’re thinking about your goal or desire how do you feel? If you’re not excited and enthusiastic and looking forward to the tasks at hand, then you have some doubting gremlins lurking behind the scene that need to be addressed. So what… I’ve never done this before. So what… I’m scared at whether this will work out. So what… I’m not sure if I’m doing this right. So what…I’m not sure if I’m good enough. When you do this you zap a doubting thought from some of its energy, some of its power. It’s okay to give doubt the space to be part of the process but you’re moving ahead with plans and actions in spite of them. They get to be passengers on your journey, not the driver. Another tactic is to doubt your doubts, which just means doubt your limitations. Who made you king or queen of “Never, Never Land?” How can you be so sure that your doubts are accurate? We live in a dualistic world. For every thing there is, by definition, “no thing.” There is the potential for the exact opposite. So for every negative thought, for every fear and doubt there is automatically its exact opposite as a possibility. The idea “No, I can’t, that’ll never happen” automatically creates the statement “Yes I can, that’s a possibility.” So if you’re going to doubt something why not doubt the negative. Guide your thoughts in a positive direction. Think of all the times when things turned out great and how wrong you were about a projected outcome. As we have seen sometime pollsters are dead wrong. how much I could accomplish and I did it anyway. that never came to pass. as to how well I was going to do. about what other people thought. when I underestimated my abilities. about something that just never materialized. Mmmmm….Maybe I shouldn’t trust my doubts. If you have a doubt pop up in your head as you pursue one of your desires, please keep what you’ve just read close to your heart. Your heart knows what you are capable of accomplishing. It knows all your desires. Let your heart lead the way and follow those things that bring you bliss.